I've been trying desperately to come up with a set of entertaining excuses for why I haven't blogged in a ridiculous amount of time -- alien abduction being among my finalists -- but the sad and boring truth is that I've had a combination of technical and personal "issues" that have left me without the resources to blog since just before the July 4 holiday. A perfect storm of factors, you could say. Eventually, a few years after everybody else, I finally added a Twitter account for this page, which you may or may not have actually seen due to the way it cleverly camouflages itself among all the other links on the right-hand sidebar (Typepad setting I can't do much about). And now, in the year 2011, I have had the brilliant revelation that I should maybe get around to making a Facebook page for this sucker, too. I know, I know. I am a visionary -- no need to tell me. If you'd give 'er a "Like", I'd be much obliged. ...which are too small for blog posts (at least, my kind of blog posts), too visual for Twitter, and too awesome not to let pass without mention somewhere. There will be extra photo goodies from time to time as well. So! I hope you'll join me on Facebook. You know, if you're into that sort of thing. Here ends this week's shameless self-promotion. Promise. 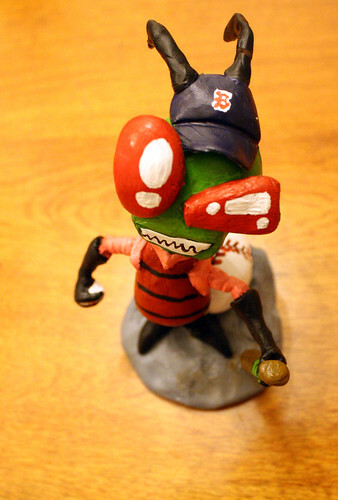 Invader Zim wearing a Red Sox hat, originally uploaded by ConfessionalPoet. Spreading holiday cheer will take a bite out of blogging time. I've spent pretty much all my free time, plus some of my sleeping time, this week frenziedly baking things and putting together cards and gifts. (I've gone a little Joan Crawford about the holidays this year, not sure why). Then, tonight when I got home from work, my first gift of the year was waiting for me on the table, along with a fantastic hand-drawn (and also baseball-themed) card by the fabulously talented artist / photographer, baseball blogger, and, obviously, amazing friend and gift-maker, Sam. And kinda propped up / sitting on a baseball. And holding a tiny bat. 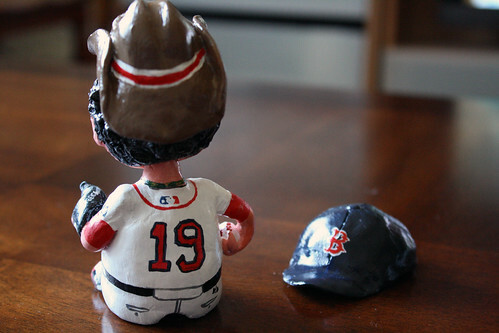 AND HOLDING A TEENSY WEENSY CLAY BASEBALL IN HIS EXQUISITELY CRAFTED LITTLE HAND. I just can't even express what this thing meant to me the moment I laid eyes on it. I was speechless, which really actually says it all. I realize many of you would be justified in presuming me dead. First there was the wedding, then there was a business trip this week, and the sequel to "Pretty Good Year" remains half-finished on my PC. I promise I will be working on it this weekend in the hopes of getting it out before the end of the year, and your regularly scheduled programming will resume next week. Just in case any of you were casting about for where to send flowers. Sox pumpkins appear to be in style this year. 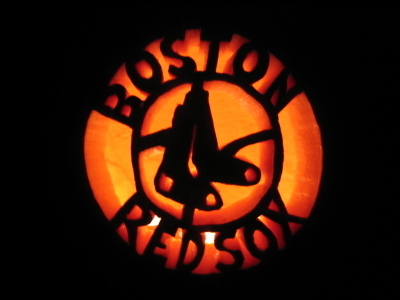 Like JoS, I received the above picture of a Sox pumpkin this week, from my friend Leeann. This is just a post to let you know that I'm giving myself the rest of the week off from blogging--the whirlwind of celebration, work and ongoing wedding planning has me in disarray and I need to start bailing out time commitments. But I promise I'll be back this weekend, and very soon I'll be bringing you Pretty Good Year: The Sequel. 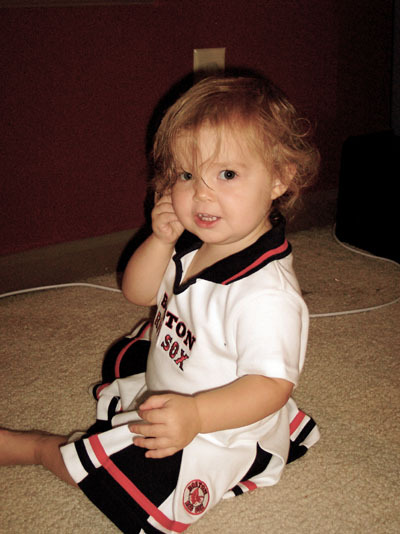 Let this happy Red Sox child soothe your pain. I thought her cuteness might help some of you take your mind off things. Things like losing (*gag*) to the Toronto Blue Jays. 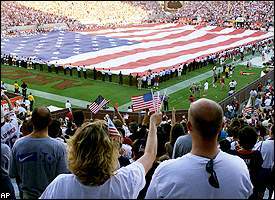 I've signed on to contribute some Patriots content to MVN's Pats blog, The Patriot Act. Check out my first post here. 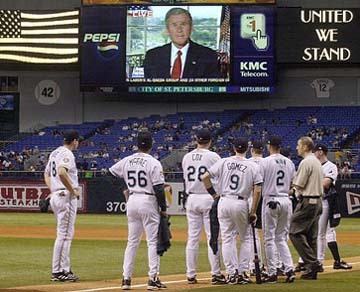 Here's a meme via a non-sports-related blogger I read, a recap of 2006 via the first line from each month's first post. January -- "I was a bit puzzled when, on Friday at Kristen's house, Sam referred to a play by a Detroit Lion, who persevered toward the end zone with several opposing players hanging from his body, as "majestic." February -- "Excerpts from The Education of a Coach continue..."
March -- "From the upcoming Sports Illustrated:"
April -- "Deadspin first put up this video of Tom Arnold vs. Michael Strahan on last night's episode of The Best Damn Sports Show, Period." May -- "I was on my way to a business lunch when the phone rang." June -- "I'm tempted to rant about this column by Tony Massarotti, but instead I want to at least try to lay out some thoughts on the subject rationally." July -- "Ortiz was up in the last of the ninth with a man on and the Sox down by three." August -- "So far, I haven't heard anyone mention one particular small incident that took place during the game last night--NESN seemed to take the tack of pretending it didn't happen immediately; neither Don or Jerry said a word about it even as it occurred." September -- "I'm not going to tell you that I've changed my mind about this season because of yesterday's game." October -- "I think Chad Finn already put it best: "Appropriate ending when you think about it, what with circumstances conspiring to ruin something potentially memorable one last time." November -- "Derek Jeter won the Gold Glove this year at shortstop." December -- "Of course the Patriots decided to show me up when I brought a guest--and a guest from another country, no less--to the game, expecting them to be on their best behavior." Cursed to First...come for the scintillating observations on the game, stay for the total non-sequiturs! P.S. Barry to the Giants. Oh, well, at least it's not the Yankees.